An industry leader who have won many awards including Large Operator of the Year at the UK Coach Awards in 2014. With family values and a great reputation for quality service from start to finish. We have the expertise and industry knowledge to provide you with the very best coach hire package. With air-conditioning and seating capacities of 49, 53 and 57. Our executive coaches offer reclining seats, on-board drinks-making service, toilet and DVD facilities. They take great care of their passengers and are highly trained by inhouse trainers. They are also all carefully DBS (CRB) checked and Whittles can also provide risk management support for your group leaders on the day. This assures you of top class service. And if anything does goes wrong (which is very rare!) we take full responsibility to put it right. Our office and maintenance team are on hand 24 hours a day 365 days a year. Including hotel accommodation, tickets to attractions, guides, ferries, organising group activities and so much more too! 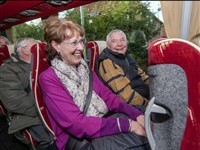 We take pride in providing great services and make sure your group have a great time and are treated like friends.